TWC just announced a whole flock of new buildings are now available in North America from Leven and Battlescale. This includes the bulk of Leven's 6mm Normandy France line, additional ACW buildings, to windmills from Spain, the low countries, and elsewhere. From Battlescale, a new European church, a variety of different haystacks, and restocks of their stock line. I commend Battlescale Buildings as excellent and The Wargaming Company gives great service. I just received a decent-sized order from TWC for Battlescale buildings and also heartily recommend their customer service and the quality of the Battlescale buildings (all of mine are 10mm, however). The 10mm Battlescale look pretty good next to some Total Battle Miniatures "Black Powder" buildings I have also in 10mm—not "perfect" if a purist, but darn close and fine on a 6x4 tabletop and my 15mm figures. Arrgh! Both of these are excellent companies and I have many of their buildings (especially Leven). 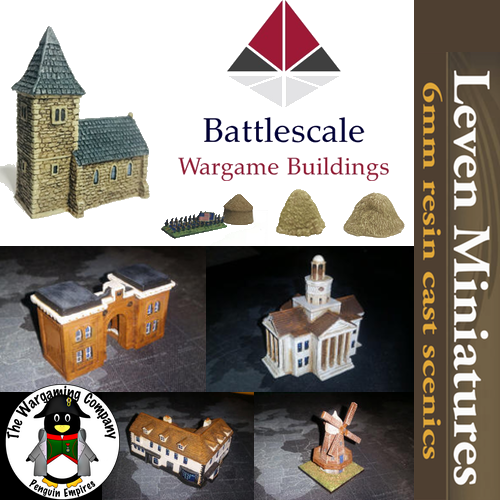 So when I saw the title of this post (New Buildings from Leven and Battlescale) I thought – Wow! Great, I wonder what they are? But it turns out they are just existing models now available in America. What a disappointment. Sorry to disappoint, the subject line limits made it impractical to fit "now available in North America" so we had to just shorten it to "new". Both Leven and Battlescale are terrific lines of buildings and terrain, glad you enjoy them and sorry we couldn't offer you some new ones! Thank you for the kind words, we try to make sure that we get questions answered and orders shipped in prompt fashions.